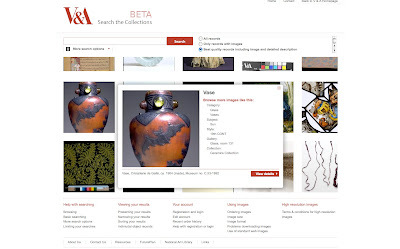 The V&A, London, have quietly launched a beta version of their new collection interface, here. It's a lovely piece of work. It was scoped and built by the V&A web team under the leadership of Gail Durbin, and her technical lead, Richard Morgan, [RMorg] , external design/IA , Other Media, UK. I was given a preview of this work on Tuesday, the day before I flew out from London back to Auckland. I was so impressed both by the scale of the offer [over a million records now searchable, as opposed to the previous 50,000] the interface design, and their plans for extension and collboration. Part of the latter includes making available an API for third party collaboration. I understand this is still under development, so if you are interested in that side of things, best talk to them direct. In the meantime feel free to go and play, here. Please note - this is a beta effort - so things might change without warning - and that includes the URL - so let's just be a little patient. In the meantime, I'm sure the odd note of congratulation won't go amiss. Try here. This is a big effort- and it shows. I am just back from London, via LA, from London. Great trip from Air New Zealand - but less than impressed with the transit arrangements currently in place at LAX. Makes no sense at all - transit passengers are held back in a corridor while everyone else leaves the aircraft, then you have to get in line to be processed by the same immigration people who have just done the first lot! Once you are processed - and given a three month entry visa which you don't want or need - you are taken back up the same corridor into a waiting room which you must have passed on the way down to immigration. Very strange experience - especially with jet lag. 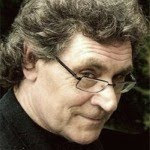 Currently starting to feel the onset of that strange interlude of supposed clarity which you know means you are going to flake out any minute - so over and out for now! Any Eliza Kors set along several different variations together with designs to perfect any coziness together with tag heuer replica sale variety of every one shoes she creates within the promote. Some form of designs for ebony, tangerine, burgundy, together with red widely-used so its possible to choose the shoes which you want one of the best. The options during boots and shoes comprise sandals resorts, squeezes, sand wedge pumps, " booties ", even more. Yow will discover everything you should when using the Eliza Kors set. Eliza Kors delivers the shoes for the dress together with most occasions. Most of the boots or shoes on the market that will be just about the most multipurpose chanel replica sale comprise most of the adhering to down the page. Any McGraw synthetic leather sneaker. If you'd rather an individual's " booties " in store an individual's joints consequently right here is the ideal sneaker on your behalf. You cannot mainly step more substantial however , truly feel pretty overly. The sneaker is made of a good very soft cognac synthetic leather which means that it's strong together with efficient for decades. Utilizing the sort of synthetic leather, slightly more everyone use it, any more pliable it should truly feel. It all consists of five-inch base back which you can dress in meant for chanel replica day to day or simply just for an affair. Every last gal necessities male leopard create squeezes for people rare hours released. Any leopard create squeezes feature a check out digital in addition to a graffiti structure. There is a good five-inch stacked back.